Twenty two years of marketing success in the Richmond, VA area. To help small and mid-sized businesses, institutions and organizations grow by working to bring their most effective brand story to life and then tell that story leveraging the latest technology to determine the most efficient media and human channels. Tom Kent began his advertising and marketing career as a copywriter at Macko and Associates in 1988. Six years later, he formed Tom Kent Advertising, a full service ad agency handling regional businesses in the Central Virginia area. Kent Communications was formed in 1999 to reflect the company’s growth and venture into web design and digital marketing strategy and service. As one of the area’s first full service marketing agencies to bring these services in house we could save our clients’ time, and money. More importantly, the websites would be consistent with the rest of our clients’ brand messaging and marketing efforts. Today, we are the next generation of marketing consultant. We offer 25 years of experience and a wide array of traditional and digital marketing services. We work for you. Services are offered in-house and through a network of over 50 strategic and production specialists. We put your project in the hands of the right professional at the lowest possible expense to you. A few ads from the early Tom Kent Advertising days. A culture of helpful, resourceful, and accountable marketing creatives. 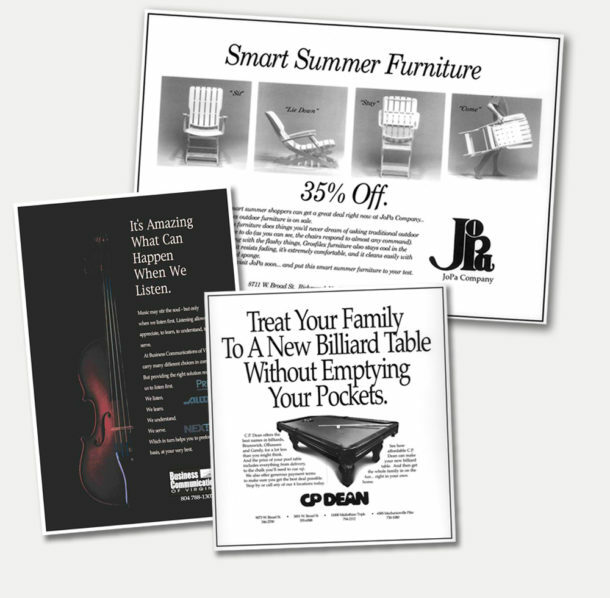 For nearly 30 years, and hundreds of campaigns, determining the right message has always been our focus. Today, with analytical information gathered through online resources, we can quickly measure results and, if needed, refine the message, offers and targeting to deliver optimal results and a higher ROI. Message and Measurement … You might call it a “whole brain” approach. Initial research into prospective company’s market presence. Our strategic approach to marketing requires an in depth understanding of a prospective client’s business. Additionally, we want to determine whether this is a good fit for both parties. 30 years of advertising campaign experience provides us with an priceless asset. We know how to develop the most effective strategy and deliver the most effective message. Our more scientific, data driven, analytic approach delivers information which can help improve a business on a variety of levels. Even a small campaign project presents opportunities to learn, profit and grow. Let us show you how.